Kitchens will usually fall into one of the kitchen designs below, perhaps with some variation on the theme. As you start to dream and plan, let the kitchen layouts below be your guide when thinking about what you'd like your end result to be. Know that your Omega Designer will design your space — whatever the shape — for maximum beauty and functionality to reflect the way you want to live. Popular with many cooks because of its efficiency, the U-shaped kitchen layout offers generous counter space and provides an efficient workflow by creating a compact work triangle. The L-shaped kitchen layout offers flexibility for both large and small homes. This kitchen design utilizes only two kitchen walls, providing an open sensibility. The L-shape minimizes traffic through the kitchen and, typically, features larger expanses of countertops, allowing ease of preparation at mealtime. 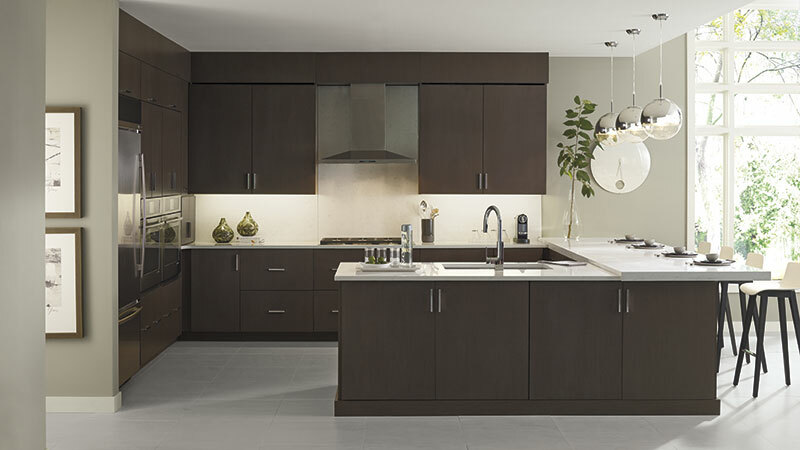 Introducing an island to an L-shaped kitchen design is ideal for entertaining. The ample counter space along the "L" of the kitchen becomes the primary work area, while the island allows guests or other family members to help you prepare or just visit. A modified "U" shape, the G-shaped kitchen layout is very efficient. This kitchen design works best when one or more of the walls are designed as half or "pony" walls, so that the kitchen still has a feeling of openness for the cook. This kitchen layout positions all of the appliances on a single wall, and it is ideal for studio apartments or other small spaces. Open on both ends, a galley kitchen design requires a minimum corridor width of 48" so that the cook can easily maneuver during meal preparation. Typically, appliances are near one another which is convenient, especially because most of the household traffic will pass though the corridor.